They say that math and music go hand and hand, so it is no wonder that my favorite teachers were my high school math teacher and a music professor at MIT. 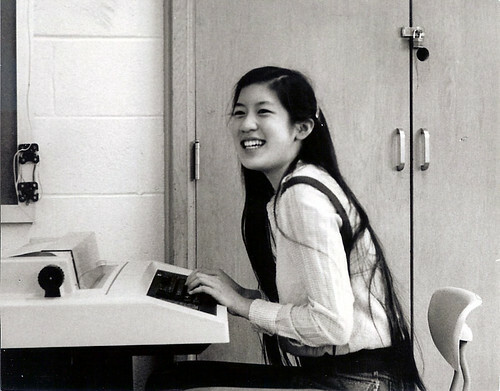 This photo was from my senior year in high school in the computer room. I'm sitting at a teletype terminal for you young'uns who've never seen such a thing, probably programming in Pascal. In high school, I excelled in math and I loved having a teacher that was exciting, fun and a bit cocky. He would make jokes all the time and wear tailored shirts and tight jeans for the girls. At the end of the year, I wrote him a letter, expressing my appreciation for all that he brought to the class . I knew it would be something that I would be terribly embarrassed about in the future, but I did it anyway. I gave it to him at the beginning of our final exam (AP Calculus BC) and watched him read it as I tried to pay attention to the exam. I wrote about all the things that went on behind his back in class and the skinny on all the students who were trying to impress him. Afterwards, he walked up and down the aisles, checking on the progress of the exam, making remarks to students with his new found information. I had mentioned that one girl was always studying like crazy for all his exams. He asked her, "Study hard?" And she answered breathlessly, "Oh, yes!" He looked over at me and winked . He knew that I barely had to work for A+ (I got a 5 on the exam). During senior awards, this girl got a award for some math project that she put a lot of work into. I ended up getting an math award for "natural ability". LOL, laziness at its finest . 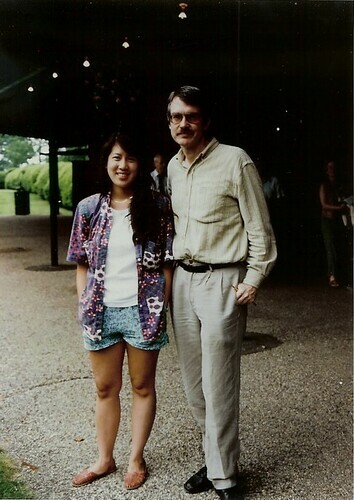 Here is a picture of John Harbison and me in 1990 several years after I studied under him. I was in awe and completely honored to be studying under one of the premier music composers of our time and was really grateful that MIT had him on the faculty. You would think that such an established musician would want to teach students at a prestigious music conservatory or university, but he somehow found a home among the nerds of MIT. There were very few music majors at MIT (I was tempted to double major but the total credits required for a double major were too high), so garnering the attention of the students who taking his courses as humanities electives was a tough job. The Harmony and Counterpoint classes were as grueling as any engineering course I took. But he inspired all of us to find the time for his music classes. He took a real interest in his students and even ate crappy dorm food with me for the "Invite your professor to dinner" night. This was one of the assignments which I had toiled well into the night for (as noted by "This took forever" on the bottom, click to see it large). It was inner part writing for Gott Lebet Noch by J.S. Bach. Basically, the highest and lowest voices were provided and we had to write the two inner voices to provide harmony. 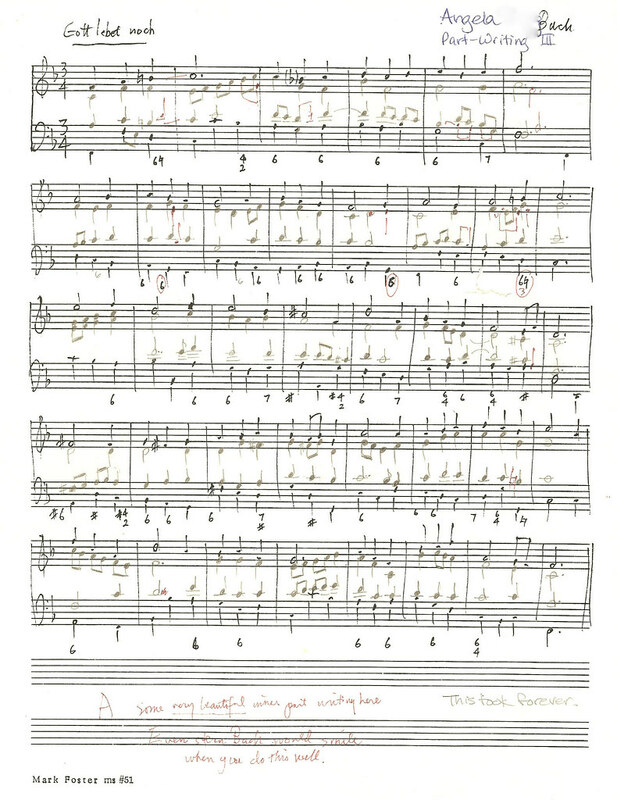 In class, he took several of the students' work and played them on the piano, one stanza for each student. Each of them sounded fine for the most part, but a bit stilted and odd at times. He left mine for last. I could feel my cheeks turn red, as it was obviously the best in the class. After he played it, everyone was going, "Wow, who wrote that?" He proudly pointed to me as I tried to hide under the table. In his comment next to the grade, he wrote, "Some very beautiful inner part writing here. Even stern Bach would smile when you do this well." This has really stuck with me over the years, and I can still hear that last line of the music in my head when I remember back. This post was written for the Top School Fundraiser's "My Favorite Teacher" Blog Contest. Please vote for your favorite essay here. You were so lucky to have such a special professor! Wish I had been in the class, too. There are some very musical folks over at MIT...esp. in the Media Lab. One of the profs. there won the Van Cliburn Amateur competiton a couple of years ago! Your story was wonderfully written – full of humor, wit and a bit of showing off (which I like it too!). How come you never told me before!! I feel like I am an ignorant and dumb mother. Anyway, I think it is never too late to know more about you. I hope you win the contest and having the cash price is not important. It is the winning getting me excited.